This inspiring and beautiful celebration of life and new experiences--now available as a board book--is the perfect gift for graduations and for fans of Oh, the Places You'll Go! Join an adventurous rabbit and his animal friends as they journey over steep mountain peaks, through bustling cityscapes, and down long, winding roads to discover the magical worlds that lie just outside their doors. Award-winning and New York Times bestselling author Pat Zietlow Miller's lilting rhyme and New York Times bestselling illustrator Eliza Wheeler's enchanting, lush landscapes celebrate the possibilities that wait beyond the next bend in the road--the same road that will always lead you home again. 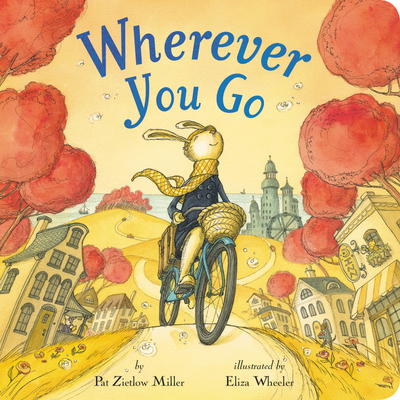 Pat Zietlow Miller is the award-winning and New York Times bestselling author of Be Kind, Sophie's Squash, Sharing the Bread, The Quickest Kid in Clarksville, and Wherever You Go (illustrated by Eliza Wheeler), among others. She lives in Wisconsin.